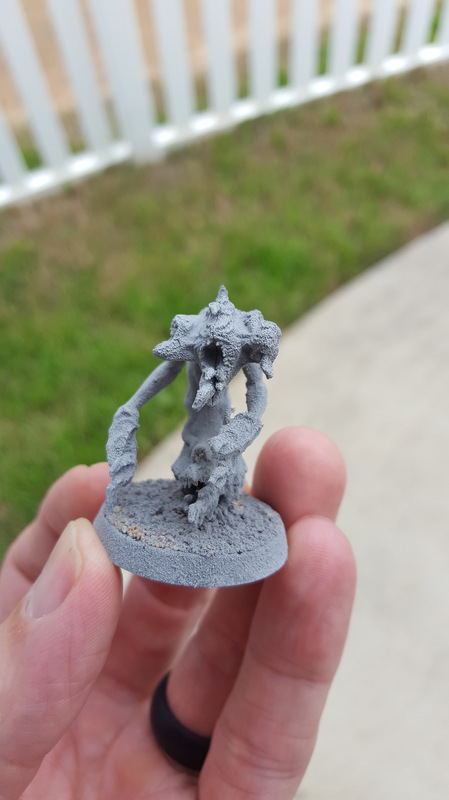 Recently, I hit some minis with either a bad can of primer or the humidity was off because I ended up blowing wet dust on a batch of ’em for my Warhammer Quest Silver Tower game. 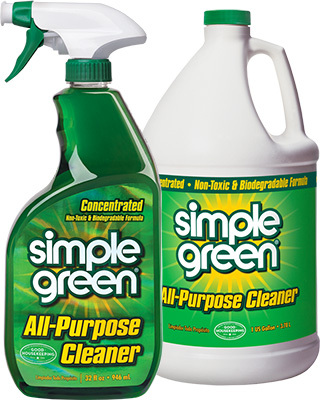 Scouting around online I read a little about a cleaning product called Simple Green that supposedly has the properties to remove paint and primer from plastic without melting the plastic itself. This is exactly what I needed so I sought out this emerald elixir. I was able to locate Simple Green at a local hardware store, but some general department or grocery stores may carry it as well. 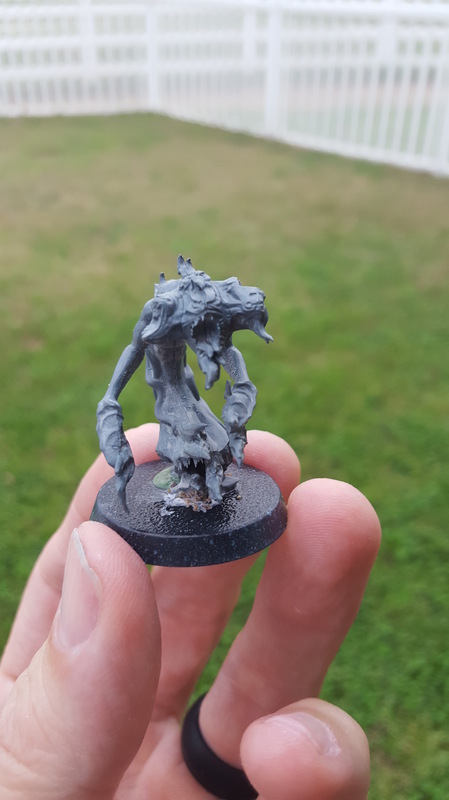 There was some hesitation on my part to apply this sort of cleaner to my minis, but as you can see from the horrific photo below, something had to be done. These minis were in rough shape. A buddy commented that he’d never seen primer dust as bad as this. Full disclosure and warning: I did notice some dust on the minis from the primer during my first spray application, and thought maybe spraying some more the new, wet coat would ‘water down’ what was on the mini or something. I was clearly wrong. 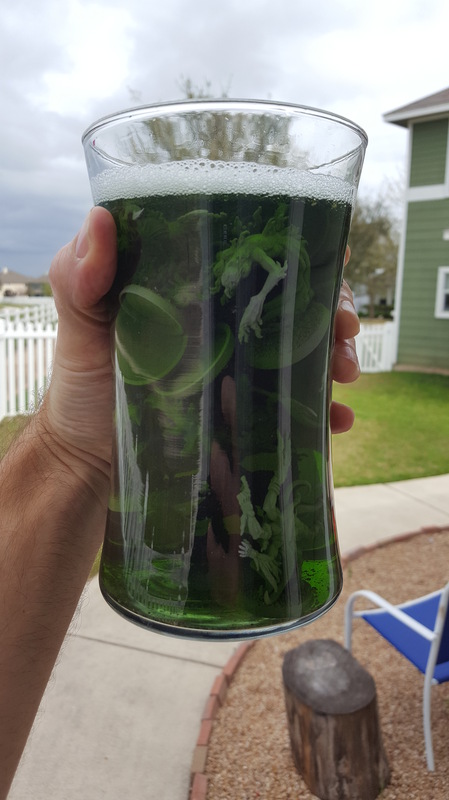 Per some of the comments online, I essentially dumped the minis in a container, poured in the Simple Green and let the concoction soak overnight. About 24 hours later, I pulled the figs out one at a time and scrubbed them with a firm toothbrush. The minis had a tacky feel to them and primer hung to them like wet skin, but with a generous amount of elbow grease I was able to scrub enough primer off to save the minis. I wouldn’t say I got 100% of it off. There were a few deep recesses that I couldn’t get out, but I’d say the Simple Green did a fantastic job. The glue keeping the mini together and attached to its base held fine…which I wondered if the Green may weaken. Besides a mess of primer flesh flayed all over one of my sinks, the Simple Green did exactly as I had read. Hard to tell, because Tzeentch flamers are some ugly cusses, but this mini is almost as good as new. There were some spots of slight discoloration, but this was going to be covered with new primer and paint, so a few splotches of color I was fine with. Unrelated to this Simple Green tale, was my struggles in settling on a color scheme. A test flamer suffered through about 2-3 variations, until I packed it in and went simple. These minis are too easy to paint for me to have spent as much time as I was trying to sort out their hues. So, workmanlike paint job aside, these minis came out all right. With Simple Green at your side, have confidence buying painted or primed minis online. Way to go, Simple Green! 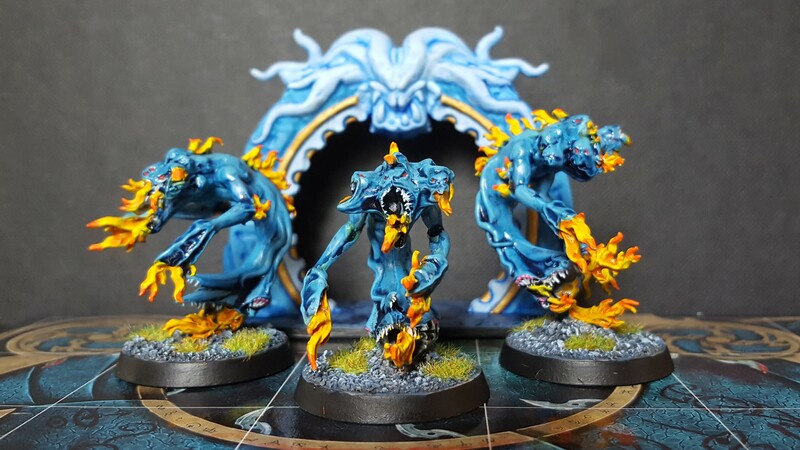 This entry was posted in Gaming, Hobby Tips, Warhammer Quest and tagged Age of Sigmar, Games Workshop, Hobby Tips, Miniatures, Silver Tower, Wargaming, Warhammer Quest by Mr. White. Bookmark the permalink. I used Simple Green to strip some metal Blood Bowl minis I got off eBay last year. I soaked them for several days and it still took a lot of scrubbing to get the paint off. Maybe because they were fully painted and not just primed, either way not sure if the extra days in the Simple Green really made much of a difference. Still a good way to save some minis. Maybe they were also sealed? Did you try soaking, scrubbing, then maybe soaking another round? I think it depends on the paint used. I did a whole batch of random pre painted models and some cleaned up like brand new and others took multiple dunks. That was the same batch that I did in a bucket that had a mouse fall in and drown. Takes you buy surprise when you reach into a bucket to grab a model and come out with a dead mouse instead.